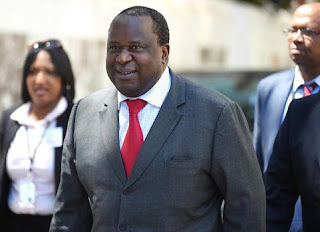 Finance minister Tito Mboweni said on Wednesday that Zimbabwe should look at introducing a new currency to counter its economic and financial challenges and also called for political leadership to intervene in ending sanctions in the troubled SADC country. Mboweni said that South African government representatives, including National Treasury director-general and the Reserve Bank governor, had met with their Zimbabwean counterparts on December 26 in Johannesburg and had had a conversation about the status of the Zimbabwean economy, the finance and banking systems, the attempts to reignite the economic health of Zimbabwe, adding that they reaffirmed their mutual commitment to working together to assist the troubled country. "I think the idea of using a new currency in Zimbabwe is a good one. I think our colleagues there are on a good wicket when it comes to that space. We are working together very well but at the end of the day it is Zimbabweans who need to fix their country," Mboweni said. "But something that is beyond my powers, presidents will have to work together to ensure that whatever remaining sanctions in Zimbabwe are removed. Those sanctions are causing big problems. Because if you want to go and do anything that involves the US dollar and you are under sanctions, political leadership hopefully will really do something to remove the sanctions. It is key and central to the revival of the Zimbabwean economy." Mboweni was fielding questions from journalists about the upcoming trip to Davos for the World Economic Forum next week. The neighbouring country across the Limpopo River is facing a severe economic crisis after President Emmerson Mnangagwa over the weekend announced a 150 percent increase in the fuel price from R19 to R41 per litre, making it the most expensive in the world. As a result, Zimbabwe has been gripped by deadly protests as citizens took to the streets and shut down major cities, demanding the reversal of the fuel price increase.